It is important that the world not forget what happened in our recent history. But it is also important that it be told in such a way that will not cause nightmares or fear of exploring the world. Lesson does an excellent job of separating the German people from those in the Nazi party. He trusted Germans before the war and returned to Germany after the war. A remarkable thing about this memoir is the strength of hope exhibited and the resiliency of this young man. Again and again it seemed he would never see his family again. Over and over he was put in a line that would lead to his death. But still he survived. Thanks to Oscar Schindler. Most people were unaware of the heroic deeds of that one man until a movie was made. However, students in grades five an up might not be aware of the film. As students, teachers and librarians continue to read and teach The Diary of Anne Frank, they should also be reading and teaching this memoir. This story continued on past the ghetto, the camps, and the death. Perhaps because of his age, young Leon was able to pick up his hopes and dreams and immigrate into the United States. He continued on to live a happy and productive life. 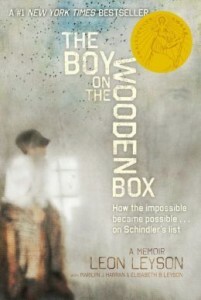 For decades, his own children did not know the story of his being a Schindler’s boy in his teens. How thrilled Leon was, though, in the fall of 1965 in Los Angeles, to have Oscar Schindler recognize and remember him. This book will fulfill multiple literacy skills as well as history and social studies requirements in the core curriculum and should be part of every school library collection. 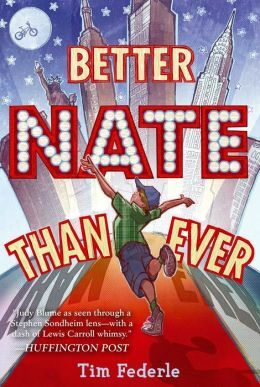 Lovable, adorable thirteen-year-old Nate sets off for his first Broadway audition, taking the reader along on a great and hilarious adventure. He and his best friend, Libby, think they’ve thoroughly prepared him for the trip and for the audition, but few things go the way they expected. Strangely enough, their preparations really do help, though. For example, they write a speech for the bus ticket agent. He uses it as a well-received monologue in his audition. His special talent turns out to be bottle walking, as they rehearsed in Fiddler on the Roof. Nate’s daydreaming and obsession with Applebee’s add to the fun. Throughout the story, it’s unclear whether Nate is moving toward something, such as a career as a singer/actor, or away from something, such as all the bullying he endures due to his small stature and love of musical theater. What is clear is that Nate finds himself somewhere along the way. And he’s a better Nate for it. Recommended for sixth grade or mature fifth graders, mainly due to content. Nate is questioning his sexuality and is constantly reminded that he appears to be a little different from the norm. He encounters several examples of homosexuality and remarks on each. Also, he does take a bus into New York by himself and even remarks on the dangers of such a trip. His mother is a recovering alcoholic, and he learns other tragic items about his family. Winner of several awards: a New York Times Notable Book of the Year, Publisher’s Weekly Best Book of the Year, and a Slate Favorite Book of the Year. The publisher’s website has a lot of content related to Nate: http://books.simonandschuster.com/Better-Nate-Than-Ever/Tim-Federle/9781442446915. The author’s website, http://timfederle.com/, is almost as fun as his books.